We love feedback! Read back through some of our happy customers testimonials. Thank you so much for suppling our posts and chain, I will personally recommend your company to anyone aiming to erect fencing. In fact, several people have already commented on the fence and asked me where the posts and chains are obtained from. I sincerely wish you and your company every success for the future, you certainly deserve this. I am very pleased with the result. Very good quality product and easy to install following the excellent instructions provided. I was limited to a depth by approx. 8 inches due to the underlying hard-core of the adjacent footpath. However, the wooden stakes held firm at that depth and the posts will now be a permanent feature. Very pleased with the next day delivery. 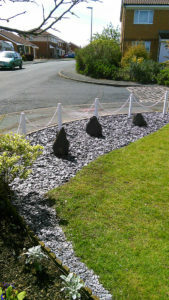 We originally had huge conifers separating us from our neighbours, once they were removed it allowed the post man / deliveries to nip across the gap, so we were looking for something suitable and easy to install and found the perfect items on your website. Our Garden used to be covered in overgrown bushes as you can see in the photos I have sent you, we are now constantly getting congratulations from passers-by on how stylish the area looks. The fence was easy to put up after a little help from your staff as this was my first use of your fencing. A very good product! We are very happy with our new 36” temporary posts and as you can see from the photos I have sent you the job has turned out extremely well and now stops people walking across our garden. The slightly thinner design of the temporary posts was easy to insert into our poor quality soil but is still sturdy enough to do the job. Many thanks for providing the new fence posts and chain, this has now been successfully installed and looks WOW! 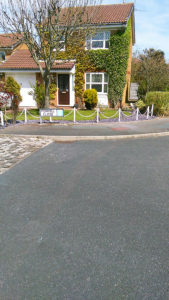 We recently purchased temporary white posts and chain, to give us a boundary between ourselves and our neighbours. 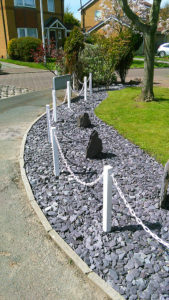 We found the process of erecting the boundary as being very straight forward, with clear easy to follow instructions. 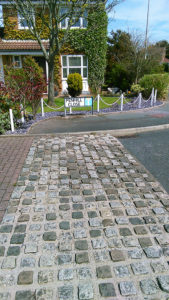 We are very pleased with the result, and it has given us the effect we were looking for. Project completed! Please find attached some pics, do feel free to use as you wish. Thanks for the help with this, I have to say the ordering, packaging and instructions were all first class, everything worked out just fine. One of my neighbours showed some interest and so I’ll direct them to you if they want the same thing. Just wanted to congratulate you on your excellent service on the order below. The order was delivered spot on the time advised and my ‘gardener’ had the posts and chain in by 4.30pm – and very smart it looks too. Very helpful service, next day delivery – I would thoroughly recommend your company. Keep up the good work. Great product, Amazing service and advice, Thanks Paul.